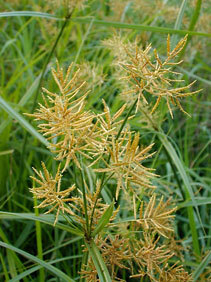 Also Called: Yellow nutsedge, chufa flatsedge. Culms: Erect, stout, strongly 3-sided, solid, glabrous, waxy. Leaves: Mostly basal, crowded, 3-ranked, 3 to 32 inches long, mostly 1/8 to 2/5 inch wide, pale green, glabrous. Inflorescences: Compound umbel, 1-several nearly sessile spikes, 1-10 rays, terminal; subtended by 3-10 involucral bracts, leaf-like, 1 or more longer than inflorescence; spikes mostly cylindrical; spikelets 8-25 per spike, radiating or ascending. Spikelets: Slender, .25 to 1.5 inches long, less than .1 inch wide, 8- to 20-flowered, flattened, golden brown; scales overlapping, several-nerved; tips blunt to pointed; stamens 3, styles 3-cleft. Fruits: Achenes 3-angled, narrowly oblong-obovoid, brownish. Habitat: Found in cultivated fields, ditches, lawns, wet prairies, waste areas, and along stream and lake edges; moist soils. Distribution: Occurs throughout Kansas but is encountered more frequently in the east 3/4. Uses: Native Americans and pioneers used the tuber-like thickenings on the roots as a food source. Indians in the Southwest chewed the roots to treat coughs and applied the chewed roots to snakebites. Ducks, wild turkeys, deer, and muskrats eat the tuber-like nutlets. Comments: "Nut" refers to tuber-like thickenings or nutlets on the rhizomes. Yellow nut grass can be a problem weed. It grows aggressively via rhizomes, making it difficult to control.